Saracen Interiors has completed a fit out and office move for market leading global electronics company, Murata Electronics, consolidating the workplace interiors consultant’s 70% rate for repeat business in the South East. The fit out project, valued at approximately £230,000, took just six weeks to complete and included space planning and design services, mechanical and electrical works, acoustic insulation, partitioning and doors, the build of a centre piece curved feature wall for the reception area and the installation of a new kitchen breakout area and furniture and fittings throughout. 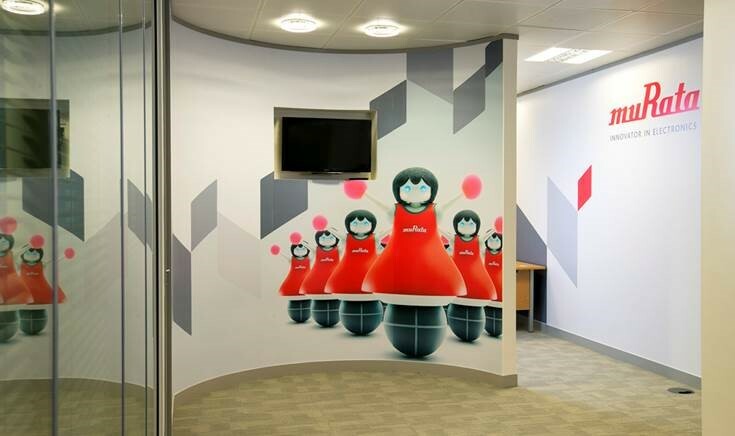 Saracen worked closely with Murata to plan the new office layout, allowing for maximum use of space, improved comfort levels to promote staff wellbeing, increased use of natural light and a unique use of corporate branding, with the curved feature wall designed to make an impact, providing an eye-catching platform for the company’s branding and associated images. Saracen is currently celebrating thirty years since its inception. Its recent clients include Coca-Cola Enterprises, Belvoir Lettings, CH2M Hill, YUM Restaurants, Tata Communications, TE Connectivity, Loma Systems, Gray’s Inn Chambers, Libra Group, Creature of London, Aspect Property Group, Motofix, Flight Safety, Countrywide PLC, Knight Frank, Mitie Engineering, Pizza Hut, Redrow Homes, Thames Water, Toshiba, TAG Aviation, Viatel, BAE Systems, Sue Ryder Care, North Surrey Primary Care Trust, Royal Berkshire and Battle Hospital NHS Trust.